3 - Nakamura forces Rusev to run into Lana leading to the Kinshasa and the win! 2 - Shane-O breaks out a shooting star to win the tag team titles! 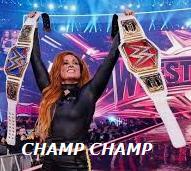 28 - Becky Lynch eliminates Charlotte Flair to win the Rumble! 29 - Seth Rollins eliminates Braun Strowman to punch his ticket to WrestleMania! 1- Inside cradle from Truth wins it. 1- Truth wins it with a rollup. 1- Compactor on Kofi and eliminates New Day. 2- Brogue Kick to Knight eliminates Heavy Machinery. 3- Superfly Splash eliminates The Bar for the win. Last edited by Franchise on Tue Feb 12, 2019 8:12 pm, edited 1 time in total. 3- Machka Kick wins it. 1- RKO for the win. 1- Rear View to Sonya. 2- Mandy Rose with The Bed of Roses (x1) on Naomi for the win. 1- Twist of Fate followed by Swanton (domino rule). 2- Rowan breaks up the pin attempt for the DQ. 2- Split-legged Moonsault by Naomi wins it. 1- Xavier Woods, Big E, and Rowan all interfere. 6- RKO outta literally nowhere and Orton eliminates Styles mere seconds after entering the ring for the win. Street Profits def. Humberto Carrillo & Stacey Ervin Jr.
Stacey Ervin Jr.- 0 pts. 0 points- Stacey Ervin Jr.